Re-purpose a cordless drill to create a DC generator. Using the motor from a cordless drill you can build a battery charger or an AC power source. By turning the motor in reverse, electricity is created rather than used. Set up the motor with a rotary crank handle, windmill blades, a water wheel or any method to get it spinning and you have a free renewable source of green energy. 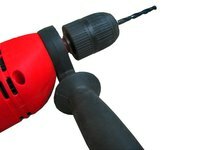 Remove the motor from the drill using a screwdriver. Connect the DC motor to your planned energy source for turning the axle, such as a water wheel, windmill blades, a hand crank or a stationary bike. How you choose to turn the motor will greatly affect where you build your generator and the length and gauge of wiring you will need. Wire the DC motor to a charge controller using a soldering iron or bolt system. A 45 amp charge controller will work the best. Set the charge controller to turn the electrical current on and off when the battery charge drops below or reaches a certain voltage level -- 11.7 volts and 14.3 volts work best for these levels. Connect the charge controller to a series of "deep cycle" batteries using the soldering iron or a nut and bolt system. Deep cycle batteries are used in golf carts and fork lifts. Businesses that use these vehicles often replace the batteries while they are still in fine condition and may allow you to take away their used batteries for free. The majority of batteries that are considered "dead" can be refurbished and brought back to life using a desulfator. The number of batteries you will need will depend on your power needs and purpose for your generator. Wire your deep cycle battery bank to an AC inverter using the soldering iron or nuts and bolts. The AC inverter converts the stored DC energy of the batteries into AC energy that is used in homes. You can now plug in a consumer-grade battery charger or any appliances that run on standard AC power.